For lesbians, gay men, bisexuals and transgender people, realizing their sexual orientation or gender identity and sharing that information with family and friends is often a gradual process that can unfold over a series of years. This section looks at the process of coming out—when and how it happens, how difficult it is, and what impact it has on relationships. This section also explores the interactions LGBT adults have outside of their circles of family and close friends—in their communities and workplaces. Some seek out neighborhoods that are predominantly LGBT, but most do not. A majority of employed LGBT adults say their workplaces are accepting of people who are lesbian, gay, bisexual or transgender. Still, about half say only a few or none of their co-workers know about their sexual orientation or gender identity. Ultimately, these journeys are personal and hard to quantify. Survey respondents were invited to elaborate on their experiences, and many of their stories are captured in an interactive feature on the Pew Research Center website. How Many of the Important People in Your Life Know? The vast majority of LGBT respondents (86%) say they have told one or more close friends about their sexual orientation or gender identity. And some 54% say all or most of the important people in their life know that they are lesbian, gay, bisexual or transgender. There are large differences here across LGB groups. Lesbians and gay men are more likely than bisexuals to have told at least one close friend about their sexual orientation (96% of gay men and 94% of lesbians, compared with 79% of bisexuals). And they are much more likely to say that most of the people who are important to them know about this aspect of their life: 77% of gay men and 71% of lesbians say all or most people know, compared with 28% of bisexuals. Among bisexuals, there are large differences between men and women in the share who say the people closest to them know that they are bisexual. Roughly nine-in-ten bisexual women (88%) say they have told a close friend about their sexual orientation; only 55% of bisexual men say they have told a close friend. Similarly, while one-third of bisexual women say most of the important people in their life know they are bisexual, only 12% of bisexual men say the same. Furthermore, 65% of bisexual men say that only a few or none of the important people in their life know they are bisexual. Among all LGBT adults, those with a college degree are more likely than those who have not graduated from college to say all or most of the important people in their life know they are lesbian, gay, bisexual or transgender (64% vs. 49%). There are no significant differences across age groups. 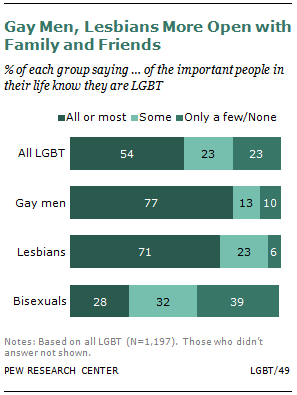 Similar shares of young, middle-aged and older LGBT adults say most of the important people in their life are aware of their sexual orientation or gender identity. There is an age gap among bisexuals, however, with bisexuals under the age of 45 much more likely than those ages 45 or older to say most of the important people in their life know that they are bisexual (32% and 18%, respectively). Lesbian, gay and bisexual survey respondents were asked how old they were when they first felt they might be something other than straight or heterosexual.14 The median age across all LGB adults is 12, although there are some differences across groups. Gay men report, on average, thinking around age 10 that they might not be straight. For both lesbians and bisexuals, the median age is 13. Among gay men, about four-in-ten (38%) say they were younger than 10 when they first felt they were not heterosexual. By comparison 23% of lesbians and 18% of bisexuals say they were younger than 10 when they first started to question their sexuality. The vast majority of lesbians, gay men and bisexuals say they were in their teens or younger when they first started to feel they might not be straight. Only 7% were in their twenties, and 4% were 30 or older. Gay men are the least likely to report first having these feelings in their twenties or beyond: 3% say they were 20 or older, compared with 14% of lesbians and 15% of bisexuals. 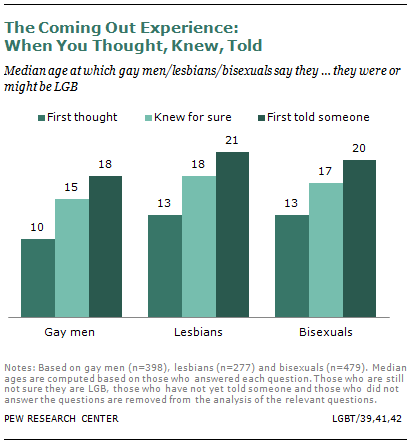 After these initial feelings, it took some time for most LGBT adults to be sure of their sexual orientation or gender identity.15 Among LGBT adults who say they know for sure that they are lesbian, gay, bisexual or transgender (92%), 17 is the median age at which they say they knew. Relatively few LGBT adults (5%) say they were sure about their sexual orientation or gender identity before they were age 10. A majority (59%) say they knew between the ages of 10 and 19. One-in-five say they knew for sure they were lesbian, gay, bisexual or transgender when they were in their twenties, and 8% say it wasn’t until they were 30 or older. Some 6% say they still aren’t entirely sure. Again, gay men reached this milestone, on average, sooner than lesbians and bisexuals. The median age at which gay men say they were sure they were gay is 15. For lesbians, the median age when they were certain about their sexual orientation was 18, and for bisexuals it was 17. The next step in the process for many people is telling a close friend or family member that you are or might be lesbian, gay, bisexual or transgender. For a small share of respondents in the Pew Research survey, this is a step they have not yet taken and may never take. Some 4% of gay men and 5% of lesbians say the fact that their sexual orientation has not come up with close friends or family members. Bisexuals are much more likely to fall into this category—24% say the fact that they are bisexual has not come up with friends and family. Among those who have told a friend or family member about their sexual orientation or gender identity, the median age at which they did this was 20. The median age is slightly lower for gay men (18) than lesbians (21) or bisexuals (20). There are modest differences on this measure by age group among gay men and lesbians.16 The median age at which gay men and lesbians younger than 30 say they first told a close friend or family member is 17. Among those ages 30 to 49, the median age is 20, and for those ages 50 and older, the median age is 21. 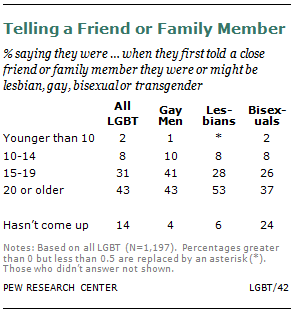 Among gay men and lesbians under age 30, 24% say they first told a friend or family member that they were gay or lesbian before the age of 15. This compares with 8% of gay men and lesbians between the ages of 30 to 49 and 3% of those ages 50 and older. Fully two-thirds of gay men and lesbians under age 30 say they shared their sexual orientation with a friend or family member before they were 20 years old. This compares with 47% of those ages 30 to 49 and 35% of those ages 50 and older. These age gaps may be related to the fact that younger adults who may not yet identify themselves as lesbian, gay, bisexual or transgender (but may in the future) would not qualify to be included in the survey. Therefore, by definition, these younger adults could not have waited until they were age 30 or older to tell someone they were gay or lesbian. Even so, these age gaps may reflect the changes that have taken place in society over the past decade or so. As the public has become more accepting of the LGBT population, it may be that gay men and lesbians feel more comfortable sharing their sexual orientation at an earlier age. It is important to note that many LGBT adults followed a different sequence in coming to realize their sexual orientation or gender identity and beginning to share it with others. Some individuals first felt they might be something other than straight, then told someone about it, but are still not entirely sure. Others may know for certain that they are lesbian, gay, bisexual or transgender but may have never shared this information with anyone. An important milestone for many lesbians, gay men, bisexuals and transgender people is telling their parents about their sexual orientation or gender identity. Overall, LGBT adults are more likely to have shared this information with their mothers than with their fathers. Most say telling their parents was difficult, but relatively few say it damaged their relationship. Some 56% of LGBT adults say they have told their mother that they are lesbian, gay, bisexual or transgender. About one-third (34%) say they have not told their mother, and an additional 10% say this is not applicable to them because their mother is not a part of their life or died before they could tell her. Roughly four-in-ten LGBT adults (39%) say they have told their father about their sexual orientation or gender identity. The same share say they have not told their father. An additional 21% say that their father is deceased or that they have no relationship with him. Overall, LGBT adults are much more likely to have told a close friend that they are lesbian, gay, bisexual or transgender than they are to have told one of their parents. Fully 86% say they have shared this information with a close friend. Across LGB groups, gay men and lesbians are much more likely than bisexuals to have told their parents about their sexual orientation. Fully 70% of gay men and 67% of lesbians have told their mother, compared with 40% of bisexuals. Similarly, 53% of gay men and 45% of lesbians have told their father, compared with only 24% of bisexuals. There is a significant difference here between bisexual men and women. Fully 47% of bisexual women say they have told their mother that they are bisexual compared with 22% of bisexual men. And while 29% of bisexual women have told their father about their sexual orientation, only 8% of bisexual men have done the same. LGBT respondents who said that they have not told their parents about their sexual orientation or gender identity were asked in an open-ended question why they had not shared this information. Two main reasons emerged. First, many respondents say it was not important to tell their parent or that the subject never came up. About one-in-four respondents (27%) who have not told their mother gave this as a reason, as did 21% who have not told their father. Bisexuals are much more likely than gay men and lesbians to say their sexual orientation never came up with their parents or that raising the subject was not important to them. Among those who have not told their mothers, 34% of bisexuals and 16% of gay men and lesbians gave this type of explanation when asked why they hadn’t told her.17 The pattern is similar among LGB adults who said they have not told their father about their sexual orientation. The second-most common response given by LGBT adults in explaining why they did not tell their mother or father about their sexual orientation or gender identity was that they assumed their parent would not be accepting or understanding of this, or they worried about how it would affect their relationship with their parent. Among LGBT respondents who have not told their mother, 22% gave this type of explanation; 20% of those who haven’t told their father gave a similar reason. There are no significant differences here between gay men, lesbians and bisexuals. One-in-five gay men and lesbians who have not told their mother about their sexual orientation say they never told her because she already knew or someone else told her. A much smaller share of bisexuals says this—only 7% say they didn’t tell their mother, but that she already knew. Among LGB adults who have not told their father about their sexual orientation, 13% of gay men say this is because he already knew, as well as 17% of lesbians and 5% of bisexuals. For LGBT adults who have not told their father that they are lesbian, gay, bisexual or transgender, about one-in-ten (12%) say they didn’t tell him because they do not have a close relationship with him. This is less of a factor with mothers: Only 4% of LGBT respondents say they haven’t told their mother about their sexual orientation because their relationship is not close. Voices: Why Didn’t You Tell Your Mother or Father? For those LGBT adults who have told one or both parents about their sexual orientation or gender identity, most say it was not easy. However, on balance, they say their relationship either grew stronger or didn’t change after sharing this information. Relatively few say their relationship grew weaker. Among those respondents who say they have told their mother, 59% say it was difficult to tell her; 40% say it was not difficult. Gay men and lesbians are more likely than bisexuals to say telling their mother about their sexual orientation was a difficult thing (64% of gay men and 65% of lesbians say it was difficult, vs. 48% of bisexuals). Four-in-ten LGBT adults (39%) who say they have told their mother about their sexual orientation say, since telling her, that their relationship has grown stronger. An additional 46% say their relationship with their mother has not changed, and 14% say their relationship has grown weaker. Lesbians are twice as likely as gay men to say telling their mother about their sexual orientation hurt their relationship (23% of lesbians say the relationship grew weaker, compared with 12% of gay men). For those who have told their father that they are lesbian, gay, bisexual or transgender, the pattern is much the same. About two-thirds (65%) say it was difficult to tell their father about their sexual orientation or gender identity, while 34% say it was not difficult. Gay men are about as likely as lesbians to say it was hard to share this information with their father (74% of gay men vs. 63% of lesbians). Since telling their father, some 54% of LGBT adults say their relationship has not changed, and an additional 32% say it has grown stronger (32%). Some 13% say telling their father made their relationship weaker. Gay men and lesbians are more likely than bisexuals who have told their father about their sexual orientation to say this made their relationship stronger. Among lesbian, gay, bisexual and transgender adults who have a sibling, roughly six-in-ten say they have told their siblings about their sexual orientation or gender identity. Two-thirds (65%) have told a sister, and 59% have told a brother. Gay men and lesbians are more likely than bisexuals to have shared this information with a sister or brother. Among gay men and lesbians who have at least one sister, large majorities say they have told a sister about their sexual orientation (75% of gay men and 80% of lesbians). By contrast, only 50% of bisexuals say they have told a sister that they are bisexual. Similarly, roughly three-quarters of gay men (74%) and lesbians (76%) with at least one brother say they have told a brother about their sexual orientation, compared with 42% of bisexuals. 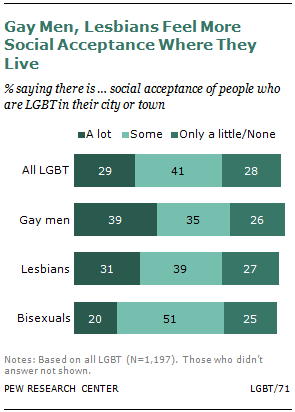 Most LGBT adults (70%) say there is at least some social acceptance of the lesbian, gay, bisexual, and transgender population in the city or town where they live. But relatively few (29%) say there is a lot of acceptance. About three-in-ten say there is only a little (23%) or no acceptance (4%) of people who are LGBT in their community. Gay men and lesbians are more likely than bisexuals to say there is a lot of social acceptance of the LGBT population in their city or town. Four-in-ten gay men (39%) and 31% of lesbians, compared with 20% of bisexuals, say there’s a lot of acceptance where they live. Among gay men and lesbians, perceptions about social acceptance differ by region of the country. Those living in the West (51%) are more likely than those living in the South (29%) or Midwest (29%) to say there is a lot of acceptance of LGBT individuals in their city or town. At the same time, Midwesterners are more likely than those living in any other region to say there is some acceptance in their community of LGBT individuals (52% of gay men and lesbians living in the Midwest say this, compared with 35% or less of those living in the Northeast, South or West). Gay men and lesbians living in the South are much more likely than those living in the West or Midwest to say there is only a little or no acceptance of the LGBT population where they live (36% in the South vs. 19% in the Midwest and 18% in the West). Gay men and lesbians with a college degree and those with annual incomes of $75,000 or higher are among the most likely to say there is a lot of acceptance of the LGBT population in the city or town where they live. Among college graduates, 48% say there is a lot of acceptance. This compares with only 29% of those without a college degree. Similarly, among those with an income of $75,000 or higher, 51% say there is a lot of acceptance where they live, while only 32% of those with lower incomes say the same. 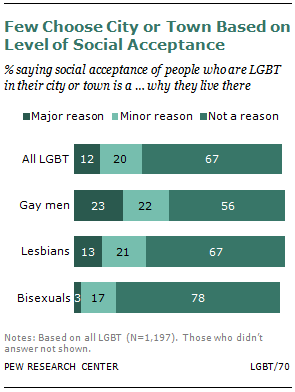 Regardless of how they feel about the level of social acceptance in their city or town, most LGBT adults say this is not a reason why they live in that particular place. Only 12% say the level of social acceptance in their city or town is a major reason for living there. One-in-five say this is a minor reason. Fully two-thirds (67%) say this is not a reason at all. LGBT adults who say there is a lot of acceptance of people who are lesbian, gay, bisexual and transgender in their city or town are much more likely to say this is an important reason why they live there than are those who say there is little or no acceptance of the LGBT population in their community. About four-in-ten respondents (38%) who say there is at least some acceptance of LGBT individuals in their community also say this is a major or minor reason for living there. Among those who say there is little or no acceptance in their city or town, only 15% say the level of social acceptance is a reason they live there. Overall, gay men and lesbians are more likely than bisexuals to say the level of social acceptance in the city or town where they live is an important reason why they live there. Some 23% of gay men say this is a major reason, and 13% of lesbians say the same. Only 3% of bisexuals say the level of social acceptance of LGBT adults is a major reason for living in their city or town. Among gay men and lesbians, there is a significant age gap on this measure. Gay men and lesbians under age 45 are much more likely than those ages 45 and older to say the level of social acceptance in their city or town is a reason why they live there. Among those ages 18 to 44, about half (48%) say the level of social acceptance is at least a minor reason why they live in their city or town. This compares with only 33% of gay men and lesbians who are 45 and older. Among the older age group, 67% say this is not a reason why they live in their community. Gay men and lesbians with a college degree are more likely than those who have not completed college to say the level of social acceptance in their city or town is one reason for living there (49% of college graduates say this is a major or minor reason, compared with 35% of non-college graduates). Among all LGBT respondents to the Pew Research survey, relatively few (12%) say they currently live in a neighborhood known for being an LGBT neighborhood. An additional 14% say that while they do not currently live in an LGBT neighborhood, they have lived in one in the past. Fully 72% say they have never lived in an LGBT neighborhood. Gay men are more likely than lesbians to have lived in an LGBT neighborhood at some point in their life. Three-in-ten gay men (32%), compared with 18% of lesbians, either live in this type of neighborhood now or did in the past. Among bisexuals, 26% live or have lived in an LGBT neighborhood. Bisexual women (29%) are much more likely than bisexual men (17%) to have done this. Among gay men and lesbians, the more important they say their sexual orientation is to their overall identity, the more likely they are to have lived in an LGBT neighborhood. Fully one-third (35%) of those who say being gay or lesbian is extremely or very important to their overall identity either live in an LGBT neighborhood now or have lived in one in the past. This compares with only 21% of those who say their sexual orientation is less important to their overall identity. Some 78% of this group have never lived in an LGBT neighborhood. Among all LGBT adults, non-whites are more likely than whites to have lived in an LGBT neighborhood (31% of non-whites vs. vs. 23% of whites say they have ever lived in this type of neighborhood). There is no significant difference by age in the share of LGBT adults who either live in an LGBT neighborhood or have done so in the past, but LGBT adults ages 45 and older are more likely than younger LGBT adults to say they did this in the past, but are not currently living in this type of neighborhood. There are no differences by relationship status either. LGBT adults who are married or living with a partner are just as likely as those who are not in a relationship to say they have lived in an LGBT neighborhood. For lesbians, gay men, bisexuals and transgender adults, their close friends are a mix of people who are LGBT and people who are not. 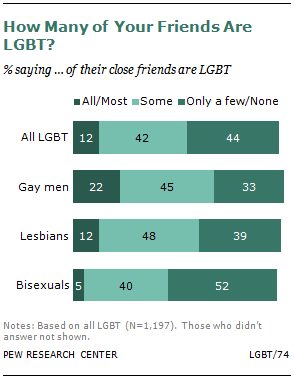 Only 12% of all LGBT adults say all or most of their close friends are LGBT. An additional 42% say some of their close friends are LGBT, about one-third (35%) say only a few of their friends are LGBT, and 9% say none of their friends are. There are significant differences across LGB groups. Gay men are more likely than lesbians or bisexuals to have a lot of LGBT friends. Some 22% of gay men say all or most of their close friends are LGBT, compared with 12% of lesbians and 5% of bisexuals. Among bisexuals, fully half say only a few (41%) or none (12%) of their friends are LGBT. Bisexual men are much more likely than bisexual women (67% vs. 47%) to say only a few or none of their close friends are LGBT. Not surprisingly, lesbian, gay, bisexual and transgender adults who have lived in an LGBT neighborhood are more likely than those who have not to have a lot of LGBT friends. Among those who live in an LGBT neighborhood now or have in the past, 21% say all or most of their friends are LGBT. Among those who haven’t lived in this type of neighborhood, only 10% say the same. Gay men find their workplaces somewhat more accepting than do bisexuals. Among employed gay men, 60% say their workplace is very accepting of gay men. Half of working lesbians say that their workplace is very accepting of lesbian employees, and 44% of bisexuals say their workplace is very accepting of bisexual employees. Although they seem to find at least some acceptance at work, only one-third of employed LGBT adults say all or most of the people they work closely with at their job are aware of their sexual orientation or gender identity. An additional 18% say some of the people they work closely with know they are lesbian, gay, bisexual or transgender. Some 22% say only a few of their co-workers know this, and 26% say no one at work knows. There are big gaps here across LGB subgroups. About half of gay men (48%) and lesbians (50%) who work say all or most of the people they work with closely at their job know that they are gay or lesbian. Among bisexuals, only 11% say most of their closest co-workers know they are bisexual. Fully seven-in-ten bisexuals who work say only a few or none of the people they work closely with at their job know they are bisexual. People who identify as lesbian, gay, bisexual, or transgender are more socially active on social networking sites than the general public, but this is likely due in part to the relative youth of the LGBT population. Eight-in-ten (80%) LGBT adults report ever using social networking sites. By comparison, in a February 2012 Pew Research survey of the general public, only 58% of adults (and 68% of adult internet users) said the same. However, equal shares of LGBT adults ages 18 to 29 and all adults ages 18 to 29 say they have ever used social networking sites—89% and 90% respectively. Some 54% of LGBT social networking site users say they have referred to being LGBT or revealed their sexual orientation or gender identity on a social networking site. Gay men (69%) and lesbians (62%) are more likely to say they have done this than bisexuals (40%). Younger LGBT social networking site users are also more likely to be open about their sexual or gender identities online than older users. Some 58% of those ages 18 to 44 say they have revealed their identity on a social networking site compared with 46% of those ages 45 and older. Overall, about half (55%) of LGBT adults say they have made new LGBT friends online or through a social networking site. Gay men are more likely to say they have met new LGBT friends online (69%) than either lesbians (47%) or bisexuals (49%). Though social networking sites are popular among LGBT internet users and many have made LGBT friends online, using the internet to discuss LGBT issues is less common. According to the Pew Research survey, only 16% of LGBT adults say they regularly discuss LGBT issues online or on a social networking site. Gay men (20%) are more likely to do this compared with bisexual men (7%). Some 16% of bisexual women and 14% of lesbians also say they regularly discuss LGBT issues online. When they are asked, in the most general terms, how happy they are with their life overall, LGBT adults are less upbeat than the general public. Only 18% of LGBT respondents say they are very happy compared with 30% of the general public.19 About two-thirds (65%) of LGBT respondents say they are pretty happy and 16% say they are not too happy. Among all adults, 57% say they are pretty happy and 13% say they are not too happy. 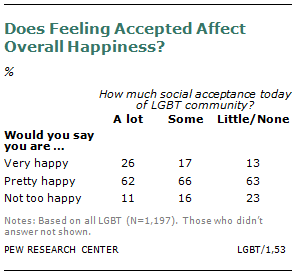 There is no significant difference across LGBT groups in the share saying they are very happy. Roughly one-in-five gay men (18%), lesbians (20%) and bisexuals (16%) are very happy. Among all LGBT adults, there is some variation in happiness across age groups. 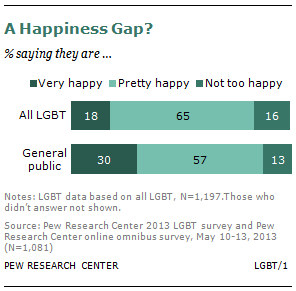 Nearly equal shares of young, middle-aged and older LGBT adults say they are very happy. However, those under age 50 are much more likely than those ages 65 and older to say they are not too happy (19% vs. 6%). There are bigger gaps by income. LGBT adults with annual family incomes of $75,000 or higher are about twice as likely as those with lower incomes to say they are very happy (32% vs. 15%). LGBT adults at the lowest end of the income scale (with annual incomes of less than $30,000) are about twice as likely as those in the middle- and highest-income brackets to say they are not too happy (23% vs. 12% for middle and high-income LGBT adults). There is a similar income gap in happiness among the general public. Among all adults, about one-in-four (25%) of those with annual household incomes of less than $30,000 say they are not too happy with their lives overall. This compares with 13% of those making between $30,000 and $74,999 and only 6% of those making $75,000 or more. LGBT adults are more likely than all adults to fall into the lowest income category (with annual family incomes of less than $30,000). This is due in part to the fact that fewer of them are married and living in dual income households (see Chapter 1 for more details). Those who are married or living with a partner are significantly happier than those who are not.20 Some 26% of LGBT adults who are married or living with a partner say they are very happy, compared with 14% of those who are not. The pattern is similar among the general public, although the happiness gap between married and unmarried adults is not as wide among all adults as it is among those who are LGBT. Perceptions of how much social acceptance there is of gay, lesbian, bisexual and transgender people these days is also related to personal happiness. A large majority of LGBT adults (77%) say that there is at least some social acceptance of the LGBT population today. Those who say there is a lot of acceptance are happier than those who say there is little or no acceptance. Among those who see a lot of social acceptance, 26% are very happy. This compares with 13% of those who see little or no acceptance. Among those who say there is some acceptance, 17% are very happy. 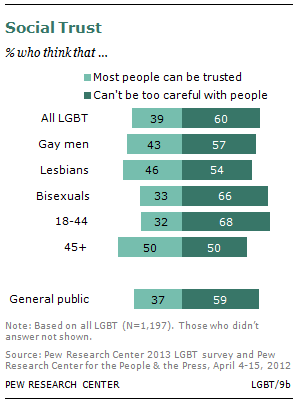 About four-in-ten (39%) LGBT adults say that, in general, “most people can be trusted” while 60% say “you can’t be too careful dealing with people.” This is nearly identical to the balance of opinion within the general public. Bisexuals are somewhat less likely than lesbians and gay men to say that most people can be trusted. There are big differences in trust between bisexual men (45% say most people can be trusted) and women (29%). Both in the general public and among LGBT adults, younger people are less likely than others to say that most people can be trusted.